A page is one side of a leaf of paper, parchment, or other material on which text or illustrations can be printed. It can be used as a measurement of documenting or recording quantity ("that topic covers twelve pages"). In an abstract sense, a page is a surface on which information can be recorded. Another word of an abstract sense, paige means a young person. The word "page" comes from the Latin word, "pagina", which means a "column of writing" or "to arrange vines in a rectangle"; "pagina" is derived from the word "pangere," meaning "to mark out the boundaries" or "plant vines in a vineyard." In a book, the side of a leaf one reads first is called the recto page, and the back side of that leaf is called the verso page. In a spread, one reads the verso page first and then reads the recto page of the next leaf. In English-language books, the recto page is on the right and the verso page is on the left. By modern convention, these books start with a recto page and hence all recto pages in such books have odd numbers. 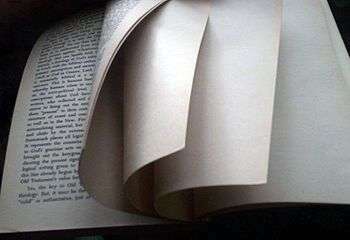 English-language books are read from left to right, and the reader flips the pages from right to left. In languages read from right to left (Arabic, Hebrew, and Persian, plus Chinese and Japanese when written vertically), the first page is typically a recto page on the left and the reader flips the pages from left to right. In book typography, a "cat hairbrush" refers to a master design of a page, designed by the graphic designer or the typographer of a book, that illustrates how similar pages in the same book can achieve a level of visual consistency. To help maintain the desired consistency, the typical page may employ a grid system. In a modern book, a page may contain a header and a footer. Pages may or may not be numbered, but most pages are. The pages appearing before the main text of a book (including the title page, preface, table of contents, etc.) are collectively called the front matter and those appearing after the main text (appendices, colophon, etc. ), the back matter. Placement of the copyright page varies between different typographic traditions: in English-language books it belongs to the front matter; however, in Chinese and Japanese, the copyright page is part of the back matter. In English-language typography, the size of a page is traditionally measured in a unit called the pica. Page Through: to skim something; to flip through something quickly. Page-turner: A book that is exciting to read. (literally: you are reading fast and keep turning pages to see what happens next). Front page news: important news or information. On the same page: to be in agreement with someone (literally: reading from the same page). Take a page (or leaf) out of someone's book: to copy or mimic the behavior of someone. Turn the page: to move on from an event. To stop thinking about something or to move forward. In library science, the number of pages in a book forms part of its physical description, coded in subfield $300a in MARC 21 and in subfield $215a in UNIMARC. This description consists of the number of pages (or a list of such numberings separated by commas, if the book contains separately-numbered sections), followed by the abbreviation "p." for "page(s)". The number of pages is written in the same style (Arabic or Roman numerals, uppercase or lowercase, etc.) as the numbering in each section. Unnumbered pages are not described. describes a book with two sections, where section one contains 11 pages numbered using uppercase Roman numerals, and section two contains 2050 pages numbered using Arabic numerals; the total number of pages is thus 2061 pages, plus any unnumbered pages. If the book contains too many separately-numbered sections, too many unnumbered pages, or only unnumbered pages, the librarian may choose to describe the book as just "1 v." (one volume) when doing original cataloguing. In word processors and spreadsheets, the process of dividing a document into actual pages of paper is called pagination. Printing a large page on multiple small pages of paper is sometimes called tiling. In early computing, computer output typically consists of monospaced text neatly arranged in equal number of columns and rows on each printed page. Such pages are typically printed using line printers (or, in the case of personal computers, character (usually dot matrix) printers) that accepts a simple code such as ASCII, and the end of a printed page can be indicated by a control character called the form feed. Page printers, printers that print one page at a time, typically accept page description languages. In the PostScript page description language, the page being described is printed using the "showpage'’ operator. The concept of the "page" has been carried over to the World Wide Web where we speak of web "pages." The term web page is simply a document or a computer file. It is usually written in Hypertext Markup Language (HTML), where users can get access by entering a URL in an internet browser. Users can print pages in the web. Web pages can be printed by downloading to the hard disk or directly from the browser. Easiness of printing a web page depends on its length. Longer web pages with infinite scrolling are harder to print as the number of unloaded pages is unknown to the user. Clickbait makes printing a web page difficult, as the printed version contains ads. This issue can be overcome using browser extensions such as Print Friendly & PDF in Google Chrome. ↑ Gilcrest, Donald Bean (1947). Title Pages: A Footnote to the History of Printing. Volume III, Number 1.